After I moved out of my parents house there are a lot of things I realized I took a lot for granted. Clean towels, clean sheets, clean dishes… clean everything without ME having to clean it. Bliss. There was also a full refrigerator and pantry! All my fav foods right there in front of me and to the right shelves filled with my favorite condiments. Mustard, ketchup (in that order) hot sauce, AI sauce, Worcestershire sauce, oh yeah and mayo). All there, sitting, waiting, ready to be squirted and slathered all over my food. at my parents home. Round these parts I definitely have a plethora of mustards and I’m pretty sure you may find some ketchup packets and a jar of mayo in the fridge but my stash is lacking for sure compare to my momma’s. Until now. May I please introduce you to the best condiment of all…..tzatziki! So delicious, on everything, veggies, pita, meat, I’ve even used it as salad dressing, and on pasta, yup! And on this aMAZing chicken croissant sandwich. Bonus plus, this is super easy to make, especially when you have all the ingredients on hand, in fact then it’s even easier than going to the store to buy some sour cream and onion chip dip. Speaking of… this would be really awesome on some chips. Next day, pull out those dipping tools and munch away! Or make some mini sliders to slather with this fantastic sauce over a bed of arugula. Ohhh I’m making that soon, be on the lookout! Looks delish! Can I used dried dill instead of fresh dill? love both items, don’t make often enough – tzatziki in the Summer is simply perfect! Welcome to the blogosphere, I look forward to reading your future posts! 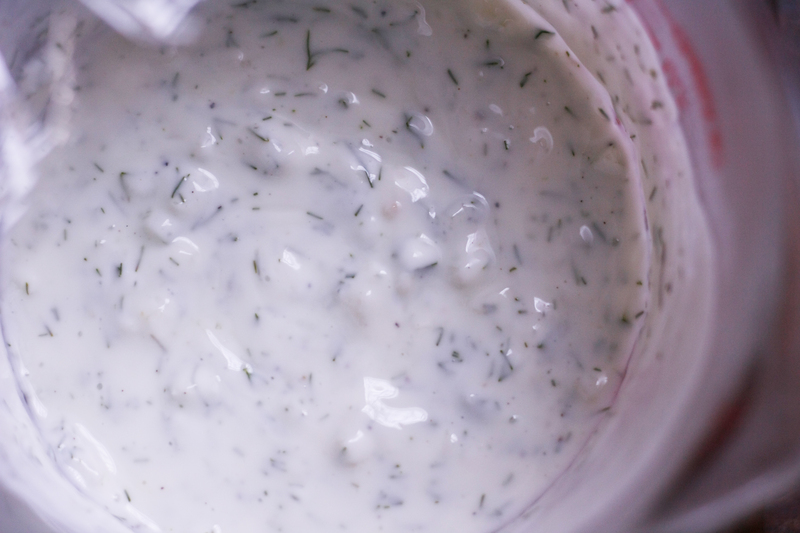 I’m convinced that there is seriously nothing yummier than homemade tzatziki sauce. So many times I’ve opened the fridge and wished that there was a stash of that stuff waiting for me. It’s definitely something that’s worth keeping in stock at all times. Such a beautiful photo…and I love the creativity of the sandwich! And it reminds me…I need to be eating more dill! LOVE that herb! Thanks! I love adding dill to some french fries! can i make this without the lemon juice??? i can’t have it, or lime, vinegar and the list goes on…. Not sure how it would turn out but I’d give it a shot. The lemon adds a nice freshness, but if you can’t substitute another acid just try leaving it out. We tried this tzatziki recipe and it’s delicious! I love to pair it with Persian cucumbers! Thanks for this recipe! It has been featured in my post of my favorite healthy snacks on my blog. Feel free to take a look! Happy snacking!